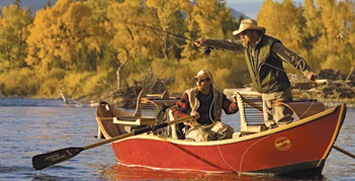 In the heart of the western U.S. trout fisheries, Montana Boatbuilders crafts high quality drift, duck and other classic rapid water boats using wood and composite construction, based on the traditions of wooden boatbuilding and the advantages of new technology. The bottom panel of these custom boats is a composite of a high strength Kevlar® reinforcement with a PP Honeycomb core which offers unsurpassed impact resistance and is very light weight. These boats are used almost exclusively in fast moving, low water rivers where the hull must take consistent hits and abrasion from rocks, sand and gravel. A standard layup of Kevlar® and fiberglass laminations on each side of Plascore PP Honeycomb Core is then attached to the side panels of the boat with fiberglass fillets. The interior floor is sprayed with a rubbery bed liner material over the inner most glass lamination and a harder polyurethane bed liner material is applied over the exterior for abrasion resistance. The same 3/4″ core material is used for false floors in the boat interior. Visit Montana Boatbuilders at www.montanaboatbuilders.com to review the companies entire product offering, including kits.